I was beside myself yesterday thinking of those folks that were there watching, so proud of their loved ones for conquering such a feat. Thousands of Parents, grandparents, friends, wives, husbands, little sons and daughters anxiously looking for the right bright pink shirt, those familiar red gloves, mom’s neon spandex, dad’s funny orange shoes, a roommate’s purple hat and freckles, or a fiance’s handmade racing shirt. They were all there for nothing but good, to embrace and cherish what has become one of the most beautiful moments in sports. In an instant, those loved ones were taken away, that spirit was erased and replaced with terror and agony. I was devastated yesterday not only for the loss of such precious lives, but for the lost memories of those who were running the race, especially those who were running it for the first time. They never got to experience that wall of sound, the absolute joy that is felt when making the final turn onto Boylston. For some, that last 1/3 of a mile was turned into a nightmare, and I grieve for them, too. So many of those running were doing so for amazing causes, celebrating the lives of some, the heroic battles of others. Their reward for spreading good in the world is supposed to be the joy that is Boyltson street, and it was taken away. The irony of this whole tragedy is that when bad things happen in the life of a runner, he or she laces up the shoes and heads out the door. We process our grief, anger, sadness, joy, and everything in between by going for a run. There something about a long run that quiets the mind, allows you to connect with the outside world, burns off those anxious feelings. I know a lot of brain power was in action this morning all over the world; a few extra miles were run, the pace was a little bit slower, the finish was a little bit stronger as runners were out trying to sort out their grief. I also know that runners, by nature, are resilient. Why else would you want to train through the coldest months of the year in order to run 26 miles. So I have the utmost faith that the turnout for next year’s Boston Marathon will be spectacular, as tens of thousands of runners will be back fighting to restore that sacred 1/3 of a mile. Right on Hereford, left on Boylston. And restored it shall be – 617. What up, people. I know, it’s been a minute since I last posted. I don’t know what to tell you other than not much is going on. The only real development is that I am “walking” with my own two feet on a regular basis. It makes things a lot easier but A) I look like I am 90 years old out for a stroll and B) it takes me 70.3 million years to get anywhere. Look at that sucker…I don’t know what the hell was done to my achilles, but that does not look normal to me. The frustrating part is that I didn’t have this injury to begin with, yet now all of my physical therapy is focused on fixing it. 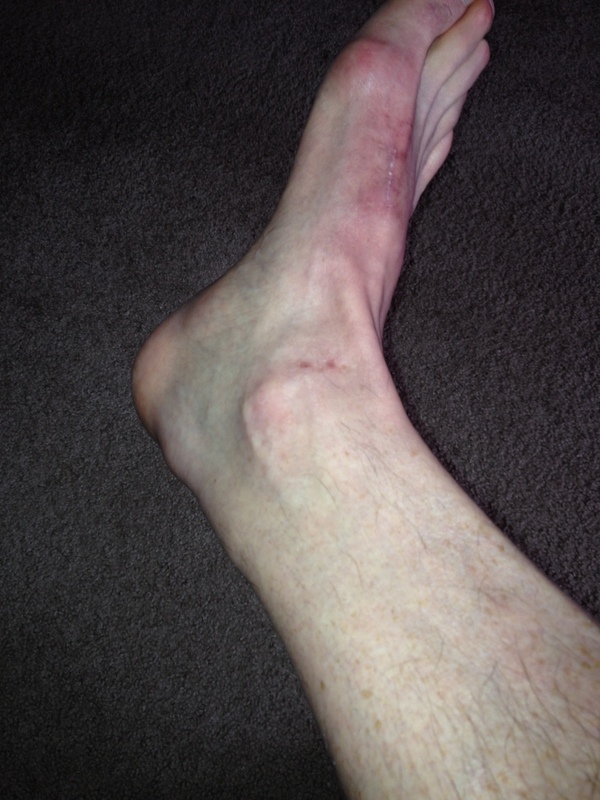 Forget ankle stability or worrying about the osteocondral talus lesion that clearly didn’t get fixed. Nope, I am going to sit out the next 6+ months because my achilles now looks like a Sochi Olympic run. Meh. Who knows what the immediate future holds, other than hobbling and looking like a weirdo wearing one compression sock. I am hopeful I will be able to run sometime during this calendar year, or at least a subtle awkward jog. Until then, I will continue to talk semi-anonymous smack to my care providers and posting odd anatomy pictures. Until next time, go on and run. I will stand here, watch and may or may not throw a stick in your path out of spite and jealousy.